60 Shiites Killed, Over 200 Injured In Wave Of Iraq Car Bombings. At least 60 people have been killed and 200 others wounded in a series of bombings in Iraq. Around 60 killed, 200 wounded in string of bombings in Iraq. The explosions took place in Baghdad and the town of Tuz Khurmato, located north of the Iraqi capital, according to police and medical officials. At least 60 Shiites have been killed and over 200 others wounded in a series of bomb attacks across Iraq, security and medical sources say. 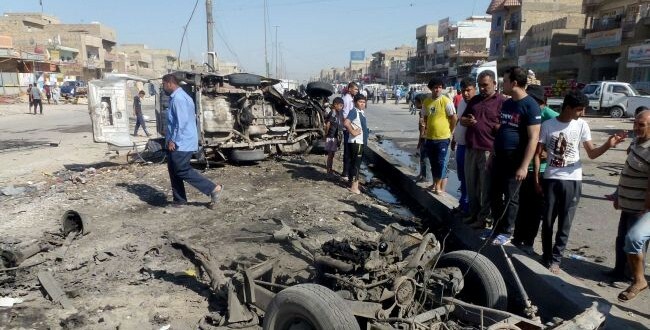 On Monday, seventeen car bombs exploded in several neighborhoods of the capital, Baghdad. Most of the areas were mainly Shia neighborhoods. Two more car bombs went off near a bus station in the city of Kut, 150 kilometers (95 miles) southeast of the capital. At least ten people died in that incident. Four people were also killed in an explosion in the town of Mahmoudiya, about 30 kilometers (20 miles) south of Baghdad. Two other blasts in Samawa, further south, killed two people. The rest of the explosions occurred in the neighborhoods of Sadr City, Habibiya, Hurriya, Bayaa, Ur, Shurta, Kadhimiya, Risala, Tobchi and Abu Dsheer. The Monday bombings come a day after 14 people, among them nine Kurdish police died in a car bomb attack in Iraq’s northern province of Salahuddin. On July 25, over 40 people were killed and many others injured in bombings and shootings across Iraq. Armed men launched an attack on Abu Ghraib and Taji prisons on July 21, sparking clashes that lasted for some 10 hours. Half a thousand prisoners escaped, and at least 20 Iraqi soldiers and 21 inmates were killed. The string of attacks across Iraq has left more than 4,000 people dead since the beginning of 2013, according to violence monitoring group Iraq Body Count. Bombings and shooting attacks have plagued Iraq since the US-led invasion of the country in 2003. July has been the deadliest month so far in 2013, with the carnage killing more than 810 people.